On the 13 and 14 October scholars and archivists working in and on Africa came together in Lusaka, Zambia, for a workshop on the theme of “Endangered and Post-Colonial Archives in Eastern and Southern Africa.” The workshop was co-organised by the Southern African Institute for Policy and Research (SAIPAR) and the British Institute in Eastern Africa (BIEA), and part-funded by the Review of African Political Economy (ROAPE) and the Journal of Southern African Studies (JSAS). We had two broad aims: to explore the challenges and realities of preserving “endangered” material in Eastern and Southern Africa, and to plan and discuss practical steps that could be taken now and for the future to preserve and promote endangered historical material in the region. 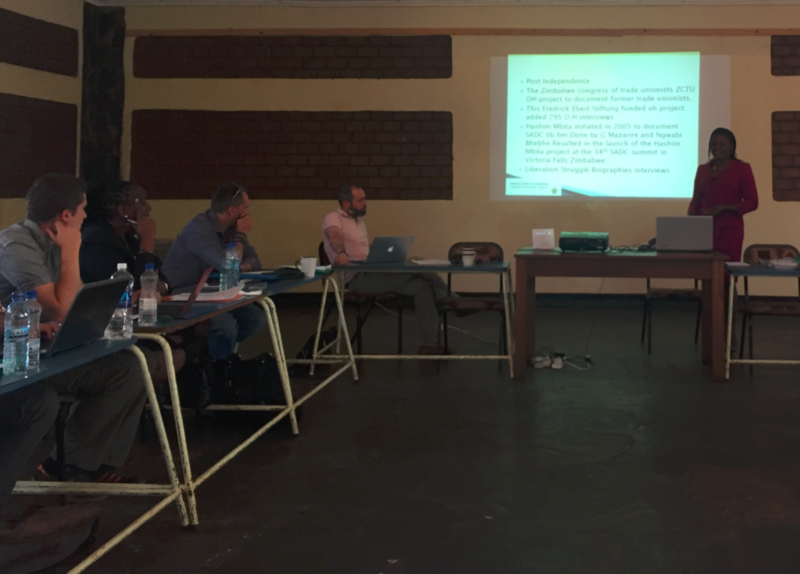 It was fitting that our venue was the Faith and Encounter Centre, Zambia (FENZA), which had been founded (by missionary and historian Hugo Hinfelaar in 2007) for the purpose of housing and preserving the endangered archive of the White Fathers Catholic mission. We interpreted the terms “endangered” and “post-colonial” broadly. A range of factors might endanger an archive, from political turbulence, to environmental factors, to the misplacing of a file by an archival assistant who perhaps had little or no training. The United National Independence Party (Zambia) archive was “endangered” not only because it was almost housed in a room above a take-away kitchen (where there would have been a risk of fire), it was also “endangered” by the people or groups who might wish to seize, steal, or destroy its politically sensitive contents. If the archive of the Presbyterian Church of East Africa (Kenya) was an “endangered” archive because it was locked away and neglected in the dusty, draughty, attic of a church bell-tower, other archives were endangered because of the volume of researchers thumbing the paper pages. 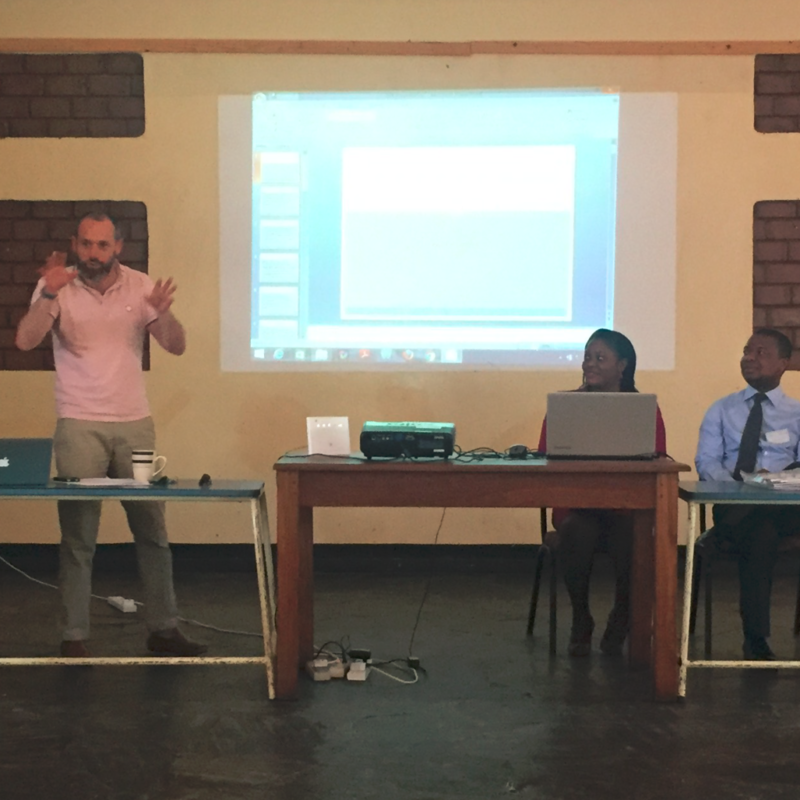 Indeed, material held in National Archives too could be “endangered”: the directors of the national archives of Malawi, Kenya, and Zambia gave us an insight to how they attempt to preserve, promote and digitise their archives in the face of financial and other constraints. An archive could be “post-colonial” because it contains material from the post-Independence period. In our first round of discussions it was noted that it was often the case that this material, i.e. material of relatively recent origin, is more at risk of going missing or not being stored appropriately than the older material from the colonial and pre-colonial periods. This raised the question: how to preserve material with a very recent origin, in particular documents that are “born digital” such as email correspondence? But the “post-colonial” might equally denote the social, economic and political structures in which repositories of historical material are embedded. From Frances Mwangi of the Kenya National Archives, we heard of the managed destruction of sensitive colonial era files by the British government and the “migration” of others to the “secret” Foreign Office repository at Hanslope Park. We also discussed how structures produced and relationships forged during the colonial period endure and how the post-colonial archives seeking to develop the skills of its staff or enhance its technological capacities manage their engagement with funding bodies and donors, such as the British Library and UNESCO, many of whom are based in former colonial metropoles. After opening with an introductory presentation by co-organiser Jessica Achberger, day one was dedicated to “the archivists.” Each pursued their own specific theme but their talks also provided a picture of the state of archives in their respective countries. We heard from Rudo Karadzandima, from the National Archives of Zimbabwe; Paul Lihoma the Director of the National Archives of Malawi; Claver Irakoze, from the Genocide Archive of Rwanda; Chileshe Musukuma and Boniface Siambusu, the Director of the National Archives of Zambia; and Francis Mwangi, the Director of the National Archives of Kenya. Ingiahedi Mduma, from the Tanzania Ministry of Information, Culture and Sports presented on government policy on archives in Tanzania and Liah Yecalo-Tecle, a graduate intern at the British Institute in Eastern Africa, reported on the Research and Documentation Centre in Asamara, the “de facto” national archives of Eritrea. General points that emerged were as follows: Physical buildings and storage conditions matter greatly when it comes to protecting archive material. Indeed, the 1965 Act of Parliament that established the Kenya National archives and Documentation Service, Frances Mwangi informed us, gave it responsibility “for proper housing, control and preservation of all public records and public archives.” Among the many threats posed to archival material in Eastern and Southern Africa are environmental and climatic factors: heat, dust, and dampness can result in the destruction of important material. The challenge to ensure that materials are held in adequate storage spaces with controlled temperatures and humidity is particularly pronounced if budgets are limited. Claver Irakoze showed the enormity of this challenge: 63 million pages of material was produced by the Gacaca courts alone in the aftermath of the genocide and the Genocide of Rwanda Archive is now responsible for their storage and preservation. Digitisation is a technique of preservation as much as a mode of dissemination. But once digitised, archives are put under pressure – often by foreign researchers – to make documents available online. We discussed the practical challenges facing archives in the era of digitisation: If a national archive would normally be accessible to approved researchers for a fee, should it not also be digitised and made available online? But how would researchers be approved through an online system? And how would an online system be able to differentiate between citizens and non-citizens? “Outside” expertise and foreign funding bodies (such as the EU, UNESCO and the British Library) often end up playing a crucial but, as Marja Hinfelaar pointed out, not unproblematic, role in collecting, preserving, and digitising archival material. Archives are not only concerned with paper documents and there are specific challenges that face the collection and preservation of oral histories and visual and audio sources. Over 4,000 recorded interviews are held in the oral history collection at the National Archives of Zimbabwe, and nearly 2,500 of these have been produced since 2003 as part of a range of projects led by the National Archive to “capture a fading memory” (to borrow the title of one). The Research and Documentation Centre in Eritrea has 8,000 audio-cassettes of oral histories that date back to the early 1970s. 22,000 images and films have been digitised by the Malawi National Archives. In addition to the 379 original testimonies, the Genocide Archive of Rwanda has produced 43 filmed interviews and 32 short documentary films. The morning session of the second day consisted of presentations from “the historians.” In the first panel we heard from Tom Cunningham (PhD student at the Centre of African Studies University of Edinburgh) on his and Thomas Molony’s recent British Library-funded “endangered archives project” at the archive of the Presbyterian Church of East Africa in Nairobi; Marja Hinfelaar (Director of Research and Programs at SAIPAR) on post-colonial archives in Zambia; and Gerald Chikozho Mazarire (Midlands State University) on the “Aluka Struggles for Freedom” project. The preservation projects described by Tom, Marja, and Gerald all operated on different scales (the small church archive, the national archive, the creation of a transnational online archive) but each of the papers touched on the theme of “Historians as Archivists” (to borrow Marja’s title). In the discussion we noted how, in post-colonial Africa, often it is the private research interests of individual historians that leads to an archive being identified, preserved or digitised. This can lead to the creation of digital archives that reflect the research interests of one individual. It also raises the broader question: who has the right and responsibility to preserve and promote particular ‘endangered archives’ – historians, universities, governments? Meanwhile, the ‘Aluka: Struggles for Freedom’ project (which saw a huge volume of material from across Southern Africa digitised and then made available online, through Jstor.org) provided ample material for a wider discussion about the ethics of accessing and disseminating archive material online. This was followed by a series of presentations from post-doctoral researchers and PhD students from the University of the Free State, Bloemfontein. First, we “navigated the South Africa National Archive” with Cornelius Muller. Then Miranda Simabwachi spoke about preservation practices in Zambia. Duncan Money discussed transnational history and the practical and theoretical issues that surround the African historian’s use of archives that are dispersed across the globe. George Bishi drew on his own experience (as a former archive assistant at the National Archives of Zimbabwe) to provide an account of the day-to-day processes of the archive from the point of view of researcher and archivist. Finally, Hyden Munene described the four Zambian archives he consulted when researching twentieth-century mining history. These papers primarily concerned historians’ encounters with archives, a topic on which there is a growing body of critical literature (for example, Antoinette Burton (ed.) Archive Stories: Facts, Fictions and the Writing of History (2006)). We heard, for example, about the idiosyncrasies of particular archives, about unique or temperamental computer-search systems, unorthodox catalogues, and strange classification systems. The question of access returned: we discussed the wide variety of rules in operation for accessing particular archives (fees, institution affiliations, waiting times, the question of the researcher’s nationality); and we heard about how research into one country’s past (in this case Zambia’s), might require travelling not only to Lusaka but also locations as disparate as Oxford’s Bodleian Library, Amsterdam’s Institute of Social History, and the American Heritage Center in Wyoming. It was difficult to avoid the fact that even (or particularly) in the age of digital scholarship and global research, the question of uneven access to archives due to uneven research budgets will not go away. Our concluding roundtable discussion focussed on practical next steps in light of the presentations. Four items were prominent. First, we discussed the possibility of producing a crowd-sourced database or website that would store and disseminate information about archives in (Southern and Eastern) Africa. The site would be a resource for researchers to identify archives and find such practical information as location, opening hours, key points of contact. Second, we discussed the possibility of producing a “Best (or Better) Practice” manual or guide for the digital preservation of endangered archives. Third, we discussed the possibility of future publications based on the presentations and discussions in the workshop. Fourth and finally, we discussed consolidating the community forged during our two days and connecting with already-existing networks. In particular we noted the potentially fruitful connection with Eastern and Southern Africa Regional Branch of the International Council of Archives (ESARBICA) and the possibility of entering a panel for the African Studies Association of Africa (ASAA) at their next conference in October 2017. Tom Cunningham is a historian at the Centre of African Studies at the University of Edinburgh primarily interested in ‘colonial’ Africa and the ways in which the history of everyday life can provide depth, detail, and nuance to abstract concepts such as ‘colonialism’, ‘modernity’ and ‘globalisation.’ Liah Yecalo-Tecle has worked on the state of endangered archives in Eritrea, exploring the successes and challenges of the Research and Documentation Centre in Asmara, Eritrea. She is a currently a researcher based in the UK with the Gill and Melinda Gates Foundation.